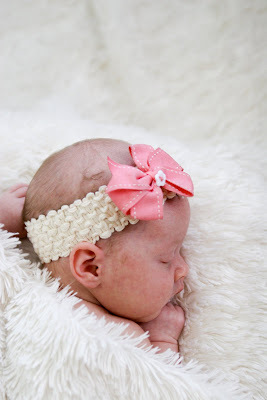 Its hard to believe our precious one is ONE month old! 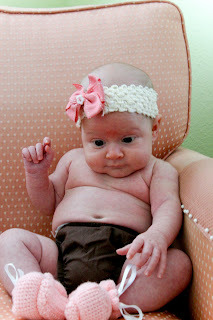 I would have posted yesterday when she ACTUALLY was one month old, but blogger decided to adopt the speed of a tortoise. Ruthie is still as sweet as ever. 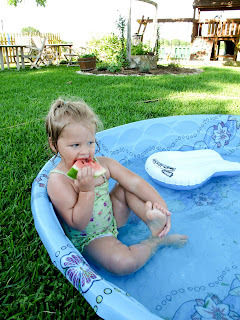 She is a typical 3rd child......all of my girls are dead on the "birth order" attributes. Ruthie isn't really doing anything overly exciting. 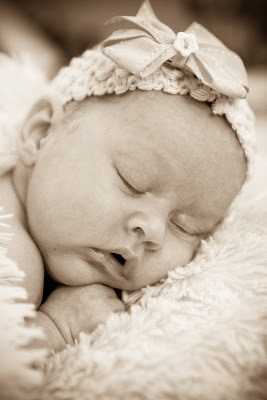 She is a wonderful sleeper and eater. I haven't heard her cry for more than a minute. I'm not joking! 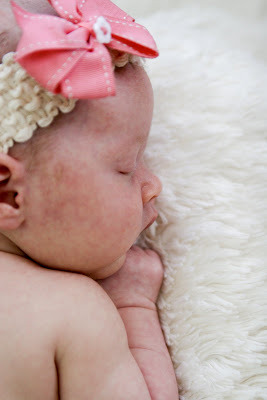 I think if I were to total the hours of her crying a day it wouldn't even come close to half an hour. Going from two to three has been relatively smooth. The Lord blessed us with an easy baby and for that we are thankful! I do think its been harder adjusting to three instead of two because you run out of arms (two arms, two kids!) and you and your spouse are outnumbered by your children. I've been doing lots of reading while I'm nursing. I got in this really bad habit of watching tv while I was nursing so I decided to change my ways and do something a little more productive. One of the books I'm enjoying tremendously right now is "The Mission of Motherhood" by Sally Clarkson. This book has been a sweet time of reflection and refocus being a new mommy again. "As I have grown through the past eighteen years of motherhood, however, I've come to appreciate the importance of the many thousands of routine moments in a mother's life, for it is in these moments that real greatness tends to be taught and caught. It is certainly important to grasp the great calling of motherhood and respond to a vision for what a family can be. But It's the way I respond to my children in everyday moments that gives me the best chance of winning their hearts. If I have integrity and patience in the small moments of life that are so important to my children, and it I approach them with a servant's heart, then I have a far better chance of influencing them in the larger and more critical issues of life." "Choosing to be a servant-mother means willingly giving up myself, my expectations, and my time to the task of mothering- and choosing to believe that doing so is the best use of my time at that moment. It means that, by faith, I have already made a decision to make myself available in the routine tasks and myriad of interruptions of daily life because I believe it is God's will for me to serve my family through them. Making this choice ahead of time means I will expect problems and needs to arise and be ready to deal with them in peace instead of impatience and resentment." Some of you might have cringed a little or gasped out loud reading the words "servant-mother". Being a servant is not a popular role to aspire to be in our culture today. After all, we have become a people where it's all about being served. Servants are nameless, faceless, unsuccessful nobodies in our culture's opinion as a whole. Its hard to do a study on motherhood and not bring up the example of Christ. Christ, our perfect example, came to serve others even to the point of serving his disciples the night before his great sacrifice on the cross by ministering to their deepest needs. Jesus spoke words of wisdom, discipline, and encouragement over his disciples, but also modeled before them daily what this looked like lived out. Jesus chose the life of a servant and sacrifice because of his deep love for us. He was eternally mindful that the decisions he made on this earth, affected those who knew him and would come to know him for all of eternity. The cost was great- his life. But, the rewards were even greater- the redemption of all of creation to bring us back to himself. In Matthew 5:26 Jesus speaks about this very thing. "It is not so among you, but whoever wishes to become great among you shall be your servant." It's not enough for us to just tell our children to live right lives and expect them to obey us. We have to show them what a Christ-filled life looks like. The more babies I have that fill up this house, the more I learn what sacrifice and serving others looks like. Its so easy to take on the role of being a "servant martyr" and have a pity party about the difficult and challenging road ahead that is most often monotonous and mundane. Or be sullen with selfishness that I'm not getting enough "me" time. I still go through this self-loathing pity party often when the days seem so long and I still haven't received a mail-order clone of myself to pitch in a helping hand around here. Don't you wish there were two of you some days??? But, when my perspective is eternal and my focus is on Christ's example, it makes me thankful that I've been blessed to be able to do this everyday of my life. It brings me to a deeper understanding of Jesus' sacrifice for me. Is vacuuming up squashed cheerios in the carpet for the 3rd time today really a big deal in the grand picture of sacrifice? No. But, for some reason it seems that way when my focus is off of Christ. The goal isn't to raise up children who are moral and good people. The goal is to raise up disciples of Christ who love Him with every beat of their heart and breath on their lips. And that takes sacrifice and faith in the ONE who has called you to do so. 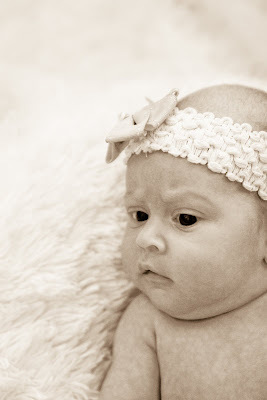 Here are some of Ruthie's one month photos. We've been enjoying our time at home. I'm going a little stir crazy at times. I'm ready to be out and about but I'm not supposed to be lifting much still. And loading a car full of girls requires some lifting so we've been taking it easy. The girls have been real troopers. 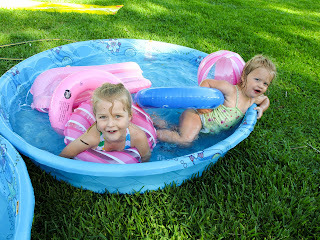 The day we got home from the hospital, Jason went and bought a couple of swimming pools to keep the girls occupied. Laney Rae has been "sharing" Ruthie's swing. When Ruthie isn't using the swing, Laney Rae plops herself down in it. 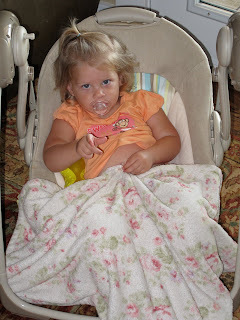 Its hilarious to watch her lounge in the swing. 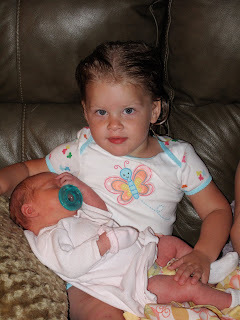 Laney Rae and Kaylyn are also quite the cuddle-bugs with their baby sister. They want to hold and kiss her constantly. I love watching them become little mamas. They love each other so much. Ruthie got her first bath! 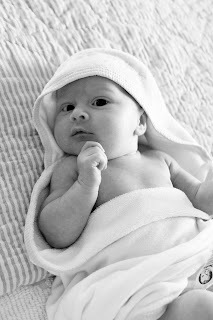 Her cord fell off and we were able to bathe her for the first time. 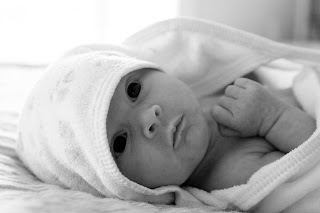 Speaking of umbilical cords.......here is a funny story that isn't for those with weak stomachs who hate non-food related things being compared to food. Kaylyn refers to umbilical cords as "bacon". She always has. 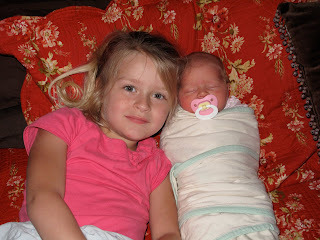 Even when Laney Rae was an infant and Kaylyn could barely talk, that is what she deemed the umbilical cord. 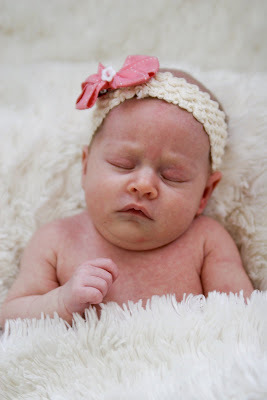 Last week, we heard Kaylyn awaken from her sleep screaming at the top of her lungs. Jason flung out of bed because he seriously thought he was about to open a can on someone in her room. It freaked us out big time! Come to find out, Kaylyn had a bad dream. Jason crawled into bed with her and they both went back to sleep. I asked Kaylyn what her dream was about the next morning. 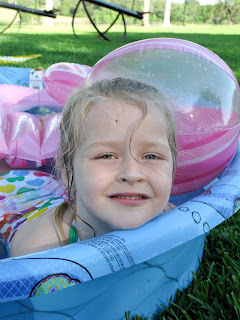 She replied,"Mommy, I dreamed that lizards were attacking Ruthie and were eating her bacon." Gross! Kids have the funniest minds. 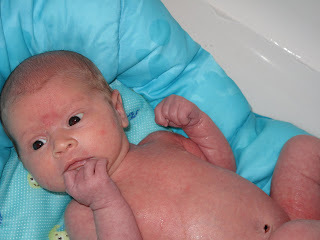 Here are some photos of Ruthie's bath. She looks a bit on the terrified side.